Add $.55 per pen. Black ink. Please allow additional working days on your order. Choose 1 barrel color from the selection shown. WBMETG: Choose 1 grip color from the selection shown. 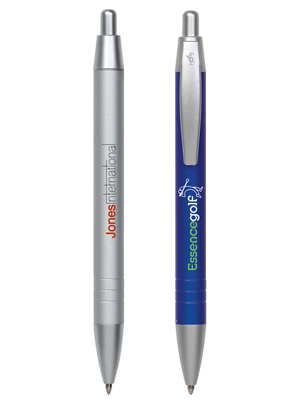 All pens include satin chrome plated clip and trim. Option 1: Opposite side of clip. Imprint Area: 1 3/4" x 5/8"
Option 2: Aligned with clip. Imprint Area: 1 1/16" x 7/8"
Packaging: Standard - 7 lbs. (approx.) @ 100 per carton. Packaged bulk in trays. Special packaging (click here).